2011:	Art Palm Beach. Projects Gallery. Palm Beach, FL. 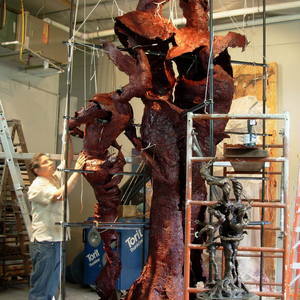 2009:	Pagus Gallery, Norristown, PA.
2005:	The Lowe Gallery, Atlanta GA.
2005: THE GATHERING, James A. Michener Art Museum, Doylestown, PA.
2001: Chaos and Crossroads ”Works in Bronze and Clay”: Atelier, Frenchtown, NJ. 2000: Two Sculptors: Madelon Powers Gallery, East Stroudsburg University, PA.
1999: What Out of Earth: Foxglove Gallery, Stroudsburg, PA.
From the Sun to the Earth to the Mantle Shift, AFA Gallery, Scranton, PA.
1997: The Roots Aloft Our Common Ground, ARTSPACE 534, Stroudsburg, PA.
1993: Planetary Skies and Aliens, Medici Center for the Arts, Philadelphia, PA.
1992: Aliens From The Home Planet, Hartnet Gallery, University of Rochester, NY. 1991:	Aliens From The Home Planet; Connexions Gallery, Easton, PA.
1984: Paintings, Sculptures & Environments, Third Street Gallery, Philadelphia, PA.
2013:	Kelly Roy Gallery, Miami, Florida & Newtown CT.
2012:	Marji Gallery& Contemporary Projects, Santa Fe New Mexico. York Arts Center; York PA.
2011:	Kelly Roy Gallery, Miami, FL. 2009:	Rodger Lapelle Gallery Philadelphia, PA. In Your Dreams, Philadelphia City Hall. 2007:	Eco Manor, Atlanta, GA.
2006:	The Lowe Gallery, Atlanta, GA. & Santa Monica, CA. Woodmere Art Museum, Philadelphia, PA. Sabine Rose Gallery, Doylestown, PA. The State Museum, Harrisburg PA.